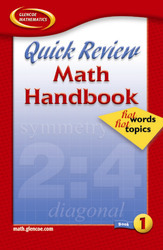 Quick Review Math Handbook: Hot Words, Hot Topics (available in English and Spanish) provides your students and their parents with a comprehensive reference of important mathematical terms and concepts to help them build their mathematics literacy. The easy-to-use format allows parents to help their children with homework assignments and test preparation. Enable students to succeed in both middle school and high school using the short instruction and practice of key standards found in the handbook. Prepare your students for state and national achievement tests with Hot Words, Hot Topics’ to-the-point explanations and exercise sets.